Endorsed by Cambridge International Examination, this second edition of Cambridge International AS and A Level Travel and Tourism has been fully updated for the Cambridge Syllabus (9395) for examination from 2017. Written by experienced authors in an engaging and accessible style, this Cambridge Elevate edition contains a wealth of internationally focussed case studies and links to the key concepts throughout. This resource offers comprehensive coverage with an international perspective and in-depth analysis of topics. 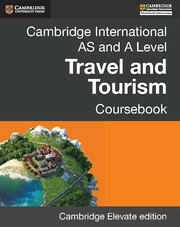 The only resource available tailored to Cambridge International AS and A Level Travel and Tourism. Free online resources containing a wide range of international case studies available at cambridge.org/9781316600634. Links to Key Concepts included throughout to enhance understanding of the syllabus. Contains up-to-date case studies and examples encouraging subject-based knowledge as well as a truly international approach. Assessment tasks at the end of each chapter to help students evaluate their own progress and mastery of Key Concepts. Wide variety of stimulating activities to check and facilitate students’ understanding. For information on how to use Cambridge Elevate editions and on supported devices please visit elevate.cambridge.org/support.